Brisk weather and a light drizzle of rain didn’t keep tens of thousands of runners from hitting the pavement and even more enthusiasts from lining the streets to cheer them on from the sidelines at this year’s ING New York City Marathon. Despite the cool weather, the mood along the streets was heating up. Yassier Payano, 17, and seven other members of the Bronx Lab School Band belted out urban beats to keep runners’ momentum going. Even though he now lives in the Bronx, Payano wanted to play in the same neighborhood he grew up in. 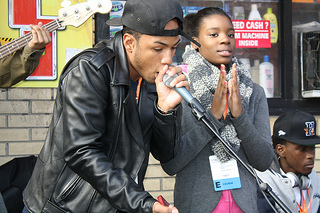 Yassier Payano, 17, of the Bronx Lab School Band, raps along the marathon route to motivate runners. Photo by Rajeev Dhir. It was a year of firsts for many revelers. 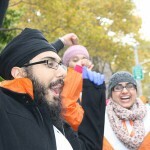 A dozen Sikh students from the Surat Initiative handed out Gatorade for the first time at the marathon. Director Gunisha Kaur said the organization serves the community through education and social advocacy. Surat also has a monthly running group, which was inspired by Fauja Singh, a 102-year old record setting marathon runner originally from India who now lives in the United Kingdom. 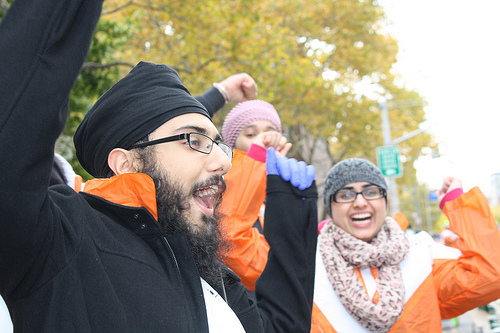 Harmann Singh, 19, of the Surat Initiative, takes a break from handing out Gatorade to marathoners to cheer them on with his friends. Photo by Rajeev Dhir. 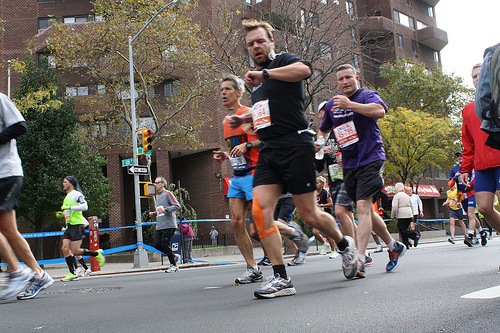 Inspiration was a major theme at the event, a year after Hurricane Sandy forced the cancellation of the 2012 marathon. “Sandy’s come and gone and we are still good,” sang Gospel singer Claude Jay before breaking into a cover of This Little Light of Mine. “Nature just said no, but it’s an awesome blessing to be back,” Jay said. 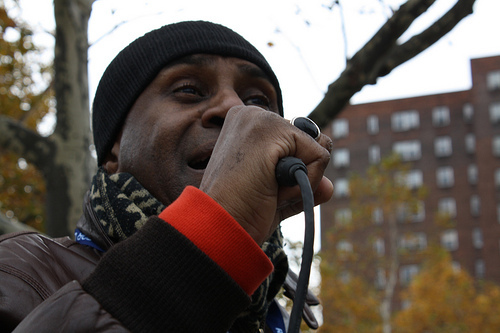 The Harlem resident said he recognizes the incredible challenge the runners take on, which is why he gives back by singing soulful Gospel music.